Attention electrical, PHVAC, locksmith, and general contractors! Looking for the ideal interior package for your Ford Transit cargo van? Well, you’ve come to right place. 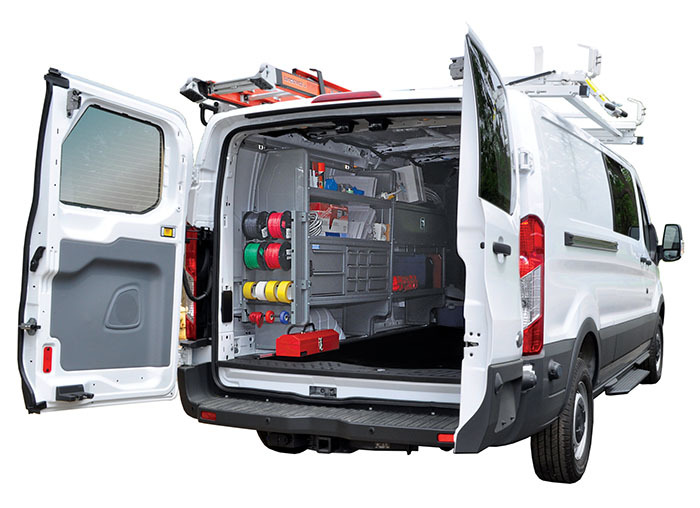 Adrian Steel’s Ford Transit interior packages makes your work easier by helping you organize all of your tools and equipment. Gone are the days where you have to climb into the cargo vehicle to reach your work equipment! Our innovative, ergonomic design allows you to place items where they can be easily accessible, helping you to work more efficient. Whether you have a low roof, medium roof, or high roof Ford Transit, Adrian Steel offers high-quality interior packages for any trades professional seeking the best in cargo management solutions. Adrian Steel is committed to providing you the best cargo management solutions in North America. Our experienced customer care team can help answer all your questions, and our extensive network of distributors supports you locally. Ready to Purchase your Ford Transit Interior Package? Contact us online or find an Adrian Steel distributor near you to get started today!